Reproductive cloning is the ‘creation’ of an identical copy of an organism, which could be an animal, a plant, or possibly even a human being. 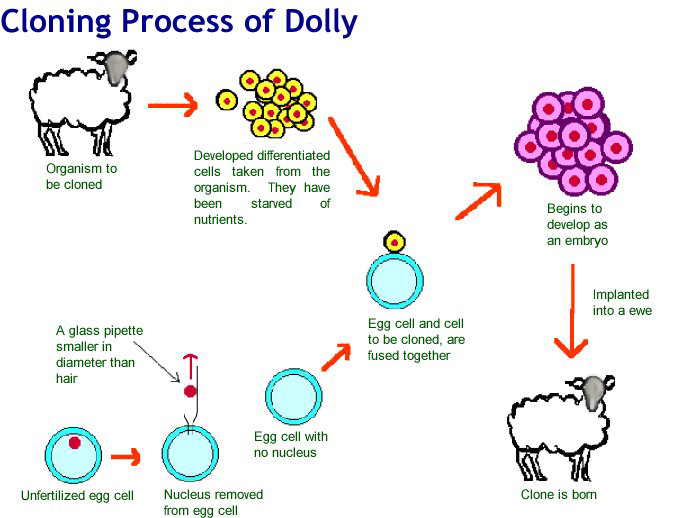 This technique came into the public eye in 1996 when (after hundreds of failed attempts) British scientists cloned “Dolly” the sheep. Dolly was born on 5 July 1996 and had three mothers (one provided the egg, another the DNA and a third carried the cloned embryo to term). In late 2001, at the age of four, Dolly developed arthritis and began to walk stiffly. This was treated with anti-inflammatory drugs. On 14 February 2003, Dolly was euthanised (put to death) because she had a progressive lung disease and severe arthritis. A Finn Dorset breed such as Dolly has a life expectancy of around 11 to 12 years, but Dolly lived to be 6.5 years old. A post-mortem examination showed she had a form of lung cancer. Since then a few groups have claimed (without proof, maybe seeking publicity) that they have cloned a human! Reproductive cloning could (if achieved) provide a “nightmare scenario” of armies of identical clones, under the command of an evil group in order to control others. Creating a cloned ‘master race’ would change the human personality and remove individual identity – fortunately, this scenario still remains fictional. Cloned people would lack two parents who normally provide family identity and background. That itself goes against Islamic ethics since due to undefined lineage and heritage that does not come from a married couple. Muslim attitudes to the cloning of animals differ. Some Muslims believe that Allah gave us knowledge and therefore we should use it. However, most Muslims would use the ethical teachings to oppose the use of cloning of animals because it interferes with the creation of Allah and may have consequences in altering the natural cycle of creation. Cloning: the scientific method by which animals or plants can be created which have exactly the same genetic make-up as the original, because the DNA of the original is used. Reproductive cloning: to make a complete identical animal, possibly a human being. Stem cell: a cell, most often taken from a 4-5 day old embryo (blastocyst), whose role in the body is yet to be determined. Therapeutic cloning: removing cells from a patient and treating them in a lab in order to produce stem cells which may be used to treat disorders, e.g. Alzheimer’s disease. This is where DNA is taken out of an embryo and replaced with DNA taken from another individual in order to generate ‘stem cells’. It is sometimes known as stem cell cloning. The aim is to take the stem cells from the modified embryo and use them in research to find treatments for a range of diseases. According to the law, any embryos used in such a way have to be killed after 14 days. This technology therefore is ethically questionable and unacceptable in Islam since it involves the destruction of fertilised embryos that are the beginnings of life (see the worksheet on abortion, Ethics 1.4). Exam tip: You need to understand the use of reproductive and therapeutic cloning in your exam. Should humans take responsibility for their actions in scientific advancements. Explain what reproductive cloning and therapeutic cloning mean. Do you think Islam allows these methods of cloning and why?